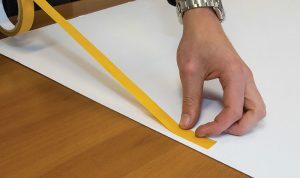 Our Polyester Tape range is our high performance double sided tapes designed specifically for demanding applications within the Print Finishing industry. 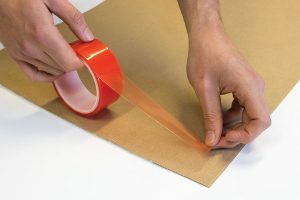 We offer a range of Polyester Tapes to suit all demands, a number of Polyester (PET) carrier thicknesses available, with a range of adhesives to suit certain applications along with a number of release liners to suit (Red Filmic & Amber and White Paper). Ideal for bonding surfaces such as paper, cardboard, PVC, plastics, plexiglass, etc and can be used indoor and outdoor providing good UV resistance. For Certain UV Varnised Board applications which is very common throughout the Print Finishing industry and is a very demanding application for an adhesive tape to adhere and create a ultimate bond, we offer our 814 which is ideal for this application. We can custom slit to any width required as all tapes are produced in jumbo rolls (1500mm x 1000m) and then re wound to commonly 50 meter logs and slit down to what ever widths (from 5mm up-to 1500mm wide), certain popular tapes and widths are kept in stock for next day despatch (quantity dependant).